Long ago, they used to make treadmills that didn’t require electricity to run. They were usually small and very cheap. They were powered by you walking on them and to make them go faster, you had to manually change the incline. They were VERY hard to use. 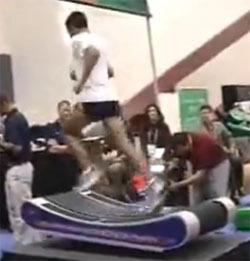 It looks like SpeedFit is trying to make a treadmill that doesn’t require electricity, but is much easier to use. I am uncomfortable with no handrails, probably because I’m used to being on a treadmill that is powered by something other than my own two legs. I love the idea that you don’t need electricity to run it. The motor isn’t what has gone out on my treadmills in the past, however. It was the TREAD that wore out far earlier than a motor. I like the idea of my exercise not costing any exercise. That’s why I go outside and run a lot of the times. Without knowing the price of this machine, it’s hard to know whether it’s something I would like or not. I suspect they are going for the gym owner market instead of trying to sell to the people who actually USE the treadmills, so don’t expect them to be cheap.